Girls worldwide suffer indignities, infection, even exploitation trying to stay in school. Being left to solutions like these. Your support of DfG kits changes lives. 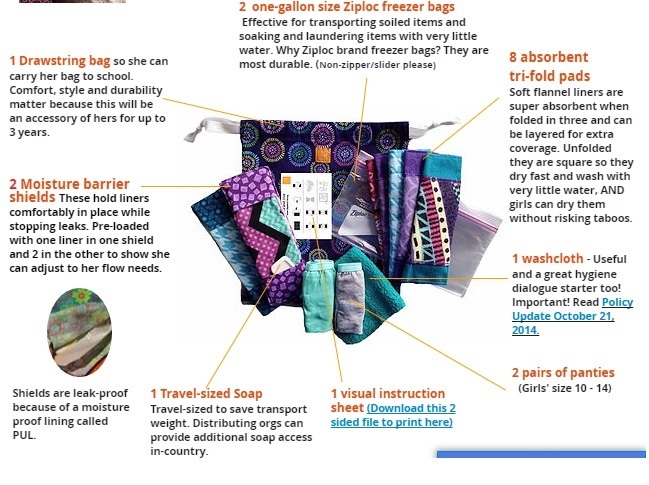 Join Liz and be part of this wonderful program - become a volunteer and make kits for DfG. The Days for Girls (DfG) kit design is the result of feedback from women all over the world. Listening is an approach that results in solutions that work. That's important, because every washable Feminine Hygiene Kit gives back up to 6 months of living in just 3 years of use. * That's 180 days of education, health, safety and dignity.